Sue Minter kicks off her campaign for governor. Sue Minter stood before more than 100 supporters Tuesday afternoon as she kicked off her campaign for governor in her hometown of Waterbury. “I’ve been told that not many Vermonters know who I am,” she acknowledged. With the help of some friends and political colleagues, Minter sought to introduce herself as an experienced, energetic problem-solver. “I am Sue Minter, and I’m running for governor to make Vermont work,” declared the 54-year-old former transportation secretary and state legislator. 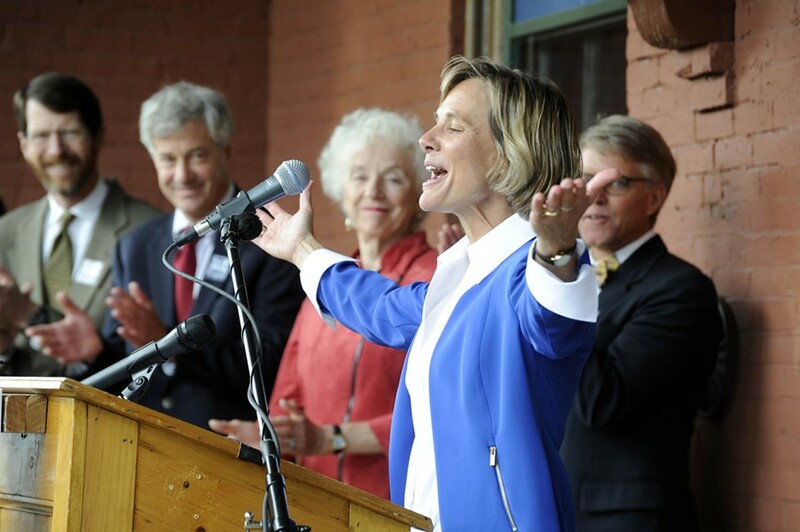 She was flanked by family, former governor Madeleine Kunin and former lieutenant governor Doug Racine on the porch of the renovated historic train station. 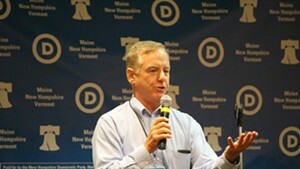 Minter grew up in Pennsylvania and Rhode Island and moved to Vermont in 1991. She is one of at least three Democrats seeking the party’s nomination for governor next year after three-term incumbent Democratic Gov. Peter Shumlin announced he’s retiring. Introducing herself to Vermonters will be Minter’s first challenge. She was the third Democrat to join the race and the third to hold a campaign kickoff. A poll last month indicated Minter trails in name recognition behind fellow Democratic candidates Shap Smith, who has served seven years as House speaker, and Matt Dunne, a former state senator who ran for governor in 2010. Lt. Gov. Phil Scott and retired Wall Street executive Bruce Lisman are seeking the Republican nomination and both plan campaign kickoffs later this fall. Friends on Tuesday told stories of Minter as an ice-skating instructor, soccer coach, mother and neighbor. Political colleagues called Minter, who has degrees from Harvard University and the Massachusetts Institute of Technology, a smart, hard-working leader. Tom Drake, principal of Crossett Brook Middle School in Duxbury, said Minter has impressed him and that she makes every kid at the door on Halloween feel special. Minter hit on many of the same themes as her opponents — strong schools, a robust economy, health care — but the former transportation secretary noted after her speech she might be the only one who dwelled on infrastructure. In the audience Tuesday, some ardent supporters wore new Minter campaign stickers. 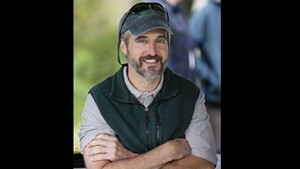 David Mears, who last summer returned to teach at Vermont Law School after five years as state Department of Environmental Conservation commissioner, said he’s firmly in Minter’s camp after working with her.